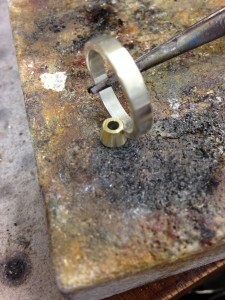 Today I thought I would write a little about actually making jewellery. 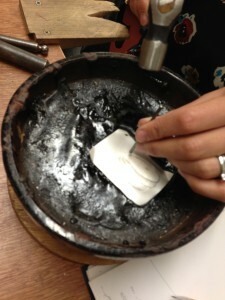 Some may call it creating or silversmithing or building or forming, but I call myself a jeweller who makes jewellery. It's as simple as that. There are many parts of a jewellers life that make up a whole business. The pricing, displaying, selling online, facebooking and twittering, invoicing, quoting, meeting customers, selling in the boutique, buying materials. And most important of all. Making.When I was a teenager I would take apart televisions with a soldering iron and use the little pieces from the back to make earrings and other jewellery items. I fell in love with metal on a Foundation Art Course in the welding shed and haven't looked back since. Now of course I use precious metals and gemstones, but the love of metal and making it into something pleasurable is still there and I hope will never leave me. 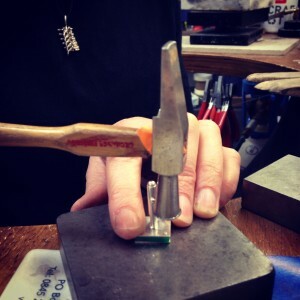 The favourite part of my job is sitting at the workbench, surrounded by tools, making jewellery. 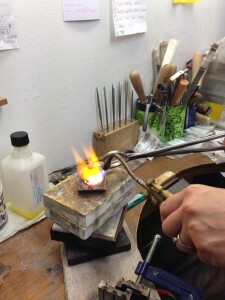 I love piercing the metal, filing it smooth, soldering pieces together to make a 3D object, setting the stones and last of all polishing.I am particularly fussy about polishing, the metal needs to be smooth and as shiny as possible for me. I am happy to stand at the polishing machine for hours, getting dusty and dirty, ruining what nails I may have left, to achieve the perfect surface. There is something so satisfying about taking a piece of raw unfinished gold or silver and making it into something that someone will find beautiful and wear with pleasure. 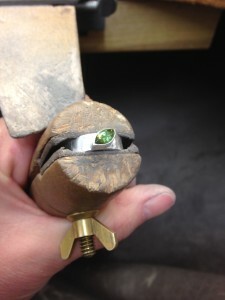 Over the next few posts I will show some jewellery in the stages of making; before, during and after,and explain the processes. I hope you will look out for them and enjoy. It's March already and I've been really busy in the gallery and workshop since the start of the New Year. Usually January is a quieter month with time to restock, plan for the year ahead and relax a little after a manic December. Taking on commissions, alterations and repairs is a large part of my business.